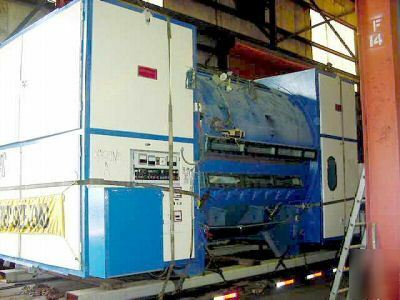 GLOBAL EQUIPMENT & MACHINERY SALES IS A WORLDWIDE SUPPLIER OF QUALITY USED MACHINERY FOR THE PAPER, FILM & FOIL INDUSTRIES. 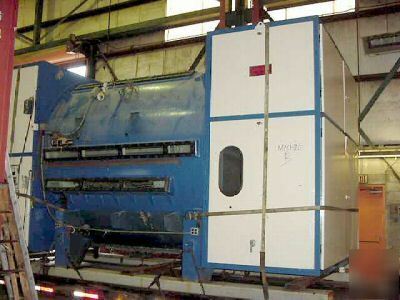 Used 80" wide General Engineering Vacuum Metallizer. Maximum 30" O.D. Rewind. (3) model 412 Stokes Pumps, (3) Roots Pumps, Vapor jet pump, Varion Diffusion Pump. (3) Polycold Units. (15) individual wire feeds with intermetallic boats. 18" OD cooling drum with new spare in crate. Tension control via load cells. Last ran at 1200 FPM. Reliance DC drive system as originally installed. Good mechanical condition. Recently shut down. Includes all documentation and spare parts. Original installation. Manufactured in 1979. Serial number 154583/606.